For all those I haven’t blabbed to, I’m currently spending the week in Paris! What better way to rock Manicure Monday in France than with a French manicure? You might be saying, Can this chick get over French manicures already? But I’m a huge fan of the French – I think it elongates your nails and is always in style. This week, I decided to spice it up a bit. The black and white trend is huge right now, and I wanted to take advantage of that with a play on the reverse French manicure – add a bit of glitter and voilà! It’s Paris, after all! Read on to see how I got this “Haute Reverse French” manicure. Still on my Nail Tek II kick – my nails are looking fab and feeling strong, I started with a coat of that. I honestly don’t see myself switching to another base coat again. 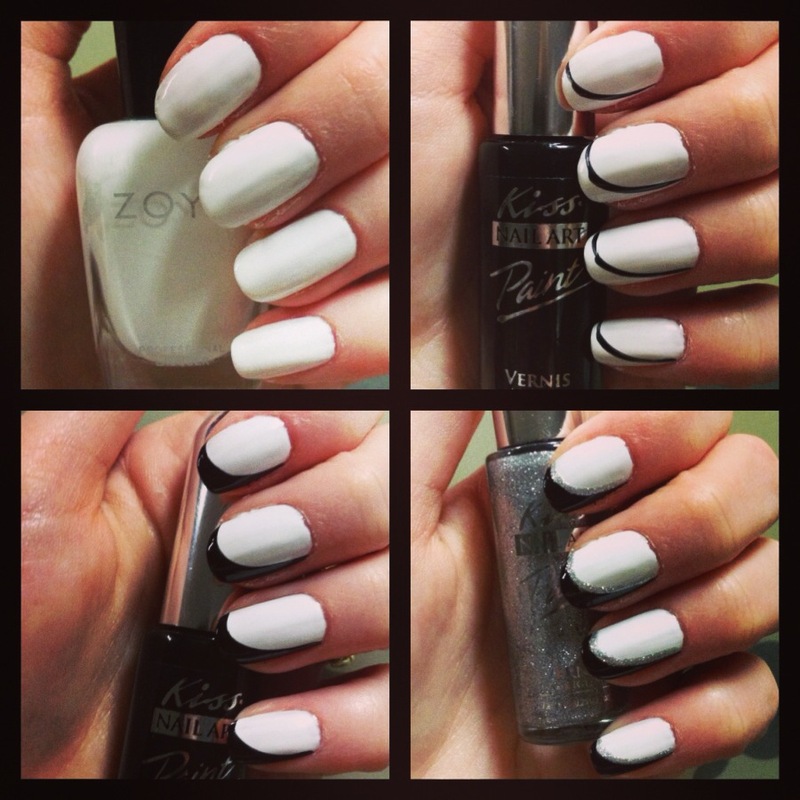 I started the manicure with two coats of Zoya’s Snow White – the perfect matte white polish. I’ve used this color before and it’s one of my favorite polishes. It’s totally opaque, so you should be good with two thin coats. Begin creating the French design with Kiss Nail Art Paints. I used these in black and silver to create the look. Start at the base of your nail, off to the side, and swoop the brush following the outline of the tip of your nail, as shown in the photo to the right. Creating the outline first really gives you more control with the shape. After you create the outline, go back and fill it in. Although the Kiss Nail Art Paint is a super skinny brush, I’d recommend filling it in with the same brush – you don’t want to end up filling in your outline with a different shade of black! Next, take your silver Kiss Nail Art Paint and carefully outline the French tip. I ended up doing two coats of silver because it wasn’t totally opaque. Before finishing with your favorite top coat, wait a while for it to dry! The last thing you want to do is smudge any black or silver into the stark white polish. The beauty of the look is in the contrast! What do you think of this manicure? Let us know in the comments!